At my booth in the mountain home show, I display my ideas for building on steep properties. To help people understand these ideas, I created a planbook of about twenty homes. I produced artwork to show people how nice these homes would fit on a steep lot. But of all those plans I created, this is the only one that sold! 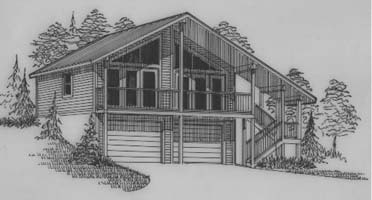 Because everyone wants a custom design, I no longer sell premade house plans, There is no way to design a nice home that would fit any mountain property. But enough people sawy my ideas for steep properties that I have been able to use these principles to design many homes. Many people are asking me to incorporate these ideas into their custom home. But I wanted to show you this one little cabin that everyone loved so much. This is a one bedroom apartment over a two car garage. Covered stairs lead up to the porch. The covered porch provides a nice view, and protects the garage doors. Both the bedroom and the living room have a nice view through the glass doors. The kitchen and bathroom are in the back. So is another stairway that goes down to the garage, convenient access during bad weather. This is the perfect little cabin to live in while you are building your dream home. When you move out, it becomes the great little guest cabin, or the private office. If you have me design your dream home, I can make sure it matches this cabin's style.